You know what PV is, yet aren't quite sure how to modify it to make a better forecast. In this short lesson, we will discuss how to modify the PV surface to match water vapour imagery and how those adjustments affect the surface sensible weather. 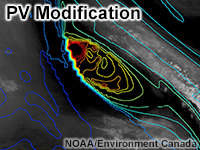 This is the fifth in a series of video lessons that introduces three different methods for modifying NWP output to add human value to forecasts. Identify the type of mismatch (spatial, temporal, magnitude, or existence) from potential vorticity overlays on water vapor imagery. Based on the type of mismatch, adjust the PV surface and then the appropriate surface sensible weather variables based on process changes. Know when to evaluate vertical cross sections of PV versus water vapor imagery.